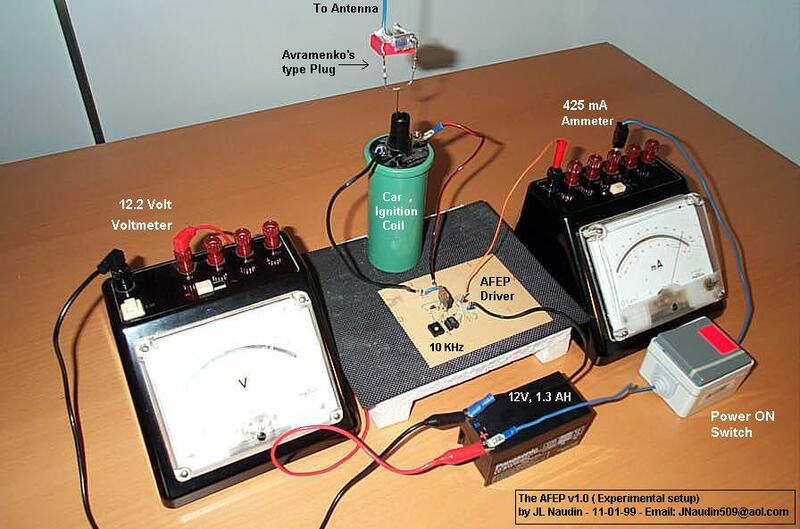 The AFEP experiment is based on the russian patent application filed on May 10th, 1993 by Stanislav and Konstantin PCT/GB93/00960 ). This a staight-forward application of the single-wire electrical energy transmission based upon the principle of longitudinal electrostatic waves as described by Nikola Tesla in the 1890s. 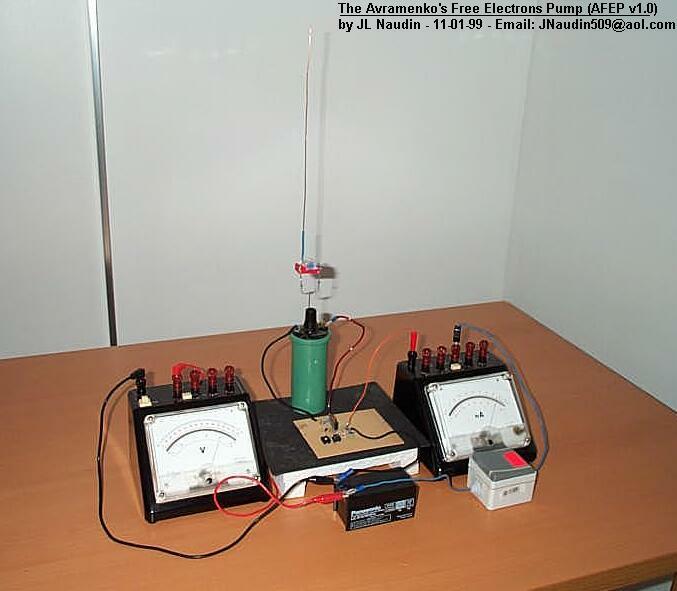 For more informations about the working principle and the main theory about the Avramenko's experiment, I suggest you strongly to read : The Electric Spacecraft Journal - issue 12, 1994 "Russian patent on Longitudinal electrical transmission" by Avramenko and "Longitudinal Electrodynamic Wave experiments" by Charles Yost. 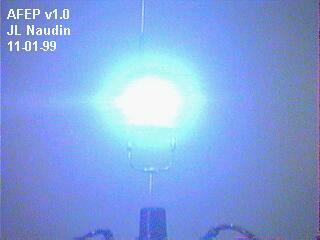 The capacitance coupling with the earth atmosphere for tapping free electrons in the air medium. Some testing devices and experiments have already been done successfully by Stefan Hartmann with the "Car ignition coil experiments with Avramenko plug" and freely released on the Web on October 26th, 1999 (thanks Stefan...). I have used a copper wire as an antenna for the coupling with the earth atmosphere (and not with the ground as in the Stefan's test ), the sucked free electrons act as a trigger for the xenon flash. The AFEP device MUST BE powered by a battery source ( I have used a 12V 1.3 AH lead acid battery) and MUST NOT BE GROUNDED. This is very important, because the system MUST BE OPEN. If you ground the AFEP generator circuit, you build a common closed system and free electrons can't be tapped from the atmosphere. I have used fast switching HV diodes (BY228). The energy stored in the 0.22uF HV capacitor is sent to the flash xenon tube trigged by the free electrons flowing through the copper antenna. 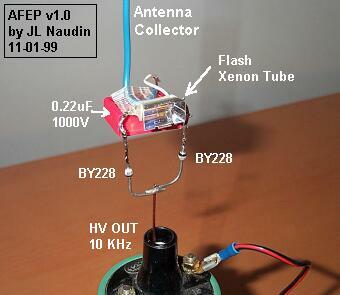 If the AFEP antenna is disconnected the xenon tube doesn't flash. - New Energy News - August 1994 : "Solid State Space-Energy Generator" by Stanislav and Konstantin Avramenko. - The Russian patent : (PCT/GB93/00960) - May 10th, 1993 by Stanislav and Konstantin Avramenko.